I’m not sure if it was intentional or due to budget restrictions but unlike bigger companies such as Nissan and Toyota, Subaru didn’t have any self-driving EVs on their stand this week at the Tokyo Motor Show. That could be a good thing, though, depending on how you look at it. What they did have was a decent range of sporty cars, with the Viziv Performance Concept car taking center stage. 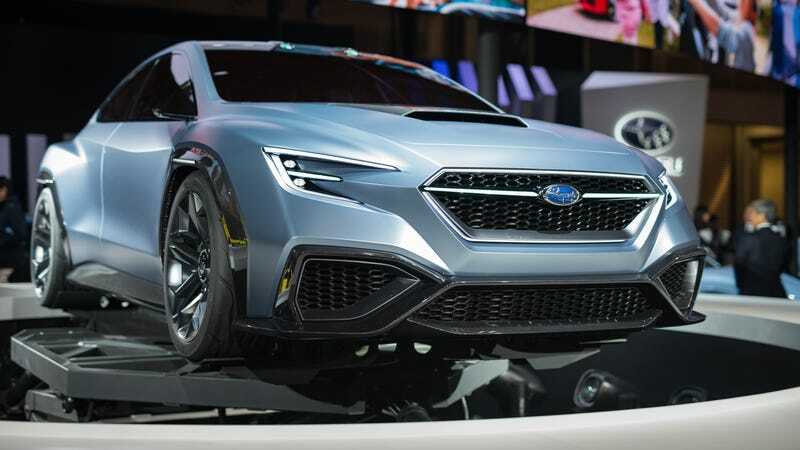 It’s meant to signal Subaru’s next generation performance sedan—read new WRX—even if the company has a history of showing gorgeous concept cars then delivering less exciting production cars. Still, the Viziv has all the makings of a WRX: the prominent hood scoop, squared off flared wheel arches, and short proportions. It also has a Symmetrical AWD system and a boxer engine, otherwise you could be forgiven for thinking it was a Civic Type-R. Among other safety features, the Viziv has the latest generation EyeSight and Driver-Assist technologies, but rather than taking full control of the car, the systems are meant to instead aid the driving experience. Mounted on the roof, the cameras give off a “roof scoop” look not unlike the old WRCs. And while the Viziv might be the WRX of the future, Subaru also showed a WRX of today, which, unless you live in Japan, you can’t have, unfortunately. The WRX STI S208 will be limited to 450 units for the Japanese market, though those 450 cars will be the most powerful WRX currently on the market. The car’s 2.0-liter turbocharged EJ20 engine has been pumped up to 329 horsepower and 318 ft-lb of torque. Included are a whole raft of STI upgrades, like a flexible tower brace, 19-inch BBS wheels wrapped in 255/35R19 Dunlop Sport Maxx RT tires, Brembo brakes, and Bilstein dampers. Cosmetically, you can tell the S208 apart from the S207 and other WRXs from the more aggressive bumpers, the dry carbon trunk spoiler, STI Recaro front seats, and the S208 badges all around. All S208s are manual only, of course. Of the 450 units, 350 will come equipped with the NBR Challenge Package which adds a dry carbon-fiber roof and the bigger rear wing. Two colors will be available; WR Blue Pearl and Crystal White Pearl. However, a limited edition Cool Khaki Grey Edition, as seen here, will also be offered—a limited edition version of an already limited edition car. If that wasn’t confusing enough “sales negotiations will be set by lottery.” Prices start from ¥6,264,000 ($55,160) rising to ¥7,106,400 ($62,578). Finally, there’s yet another new BRZ with cosmetic changes and an untouched engine. The STI Sport trim is being sold as the top model for the BRZ in Japan, and features an exclusive front bumper with an STI ornament, front suspension developed with STI technology, and coil springs tuned by STI. Basically, everything has been touched by STI except for the engine. It will also be available with the Cool Grey Khaki color, except only 100 will be made and will also be sold by lottery. Some other random stuff on display from Subaru: the Impreza Sport Concept, which looked like a normal Impreza with a central exhaust and the XV Fun Adventure Concept, which seemed to just be a XV crossover with a tent on the roof and a ladder with a “do not climb” sign attached to it. Only in Japan, I guess.